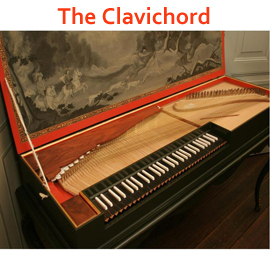 The Clavichord – Is it Related to the Piano? One can say that the clavichord is the grandmother for the piano. Therefore it is very important for piano players to be aware of its origin and how it functions. On this page you will gain some vital information about this type of musical instrument and how it was used as unique model for post-keyboard instruments such as the harpsichord and piano. The clavichord was invented in the early fourteenth century. It is a European stringed keyboard instrument known from the late Medieval, through the Renaissance, Baroque and Classical eras. According to a number of sources, it was widely used as a practice instrument and as an aid to composition rather than a performance instrument. One reason for this was that it was not loud enough for larger performances. The term “clavichord” comes from the Latin word clavis meaning "key" and chorde which means "string". This keyboard instrument that has a rectangular case is played like the harpsichord and piano by pressing the keys. However, the strings are struck by metal blades whereas the strings of the harpsichord are plucked by a plectrum and the strings of the piano are stricken by a felt-covered hammer. The tone of the clavichord is softer compared to the harpsichord and piano. The clavichord produces sound by striking brass or iron strings with small metal blades called tangents. Vibrations are transmitted through the bridge(s) to the soundboard. Like the harpsichord the use of the clavichord has decreased and both instruments have been substituted by the piano. However, the unique sound created by the clavi-chord is placed on electronic keyboards and synthesizers; instruments that are used more frequently in the 21st century. For more information about the clavichord, please visit en.wikipedia.org/wiki/Clavichord.